Esta Eiger Stecher and Gregory K. Palm both serve as general counsel of The Goldman Sachs Group, Inc. Ms. Stecher was appointed general counsel of Goldman Sachs in 2000. Opportunities for women in the legal profession have increased tremendously over the last two decades, strengthening the profession as a whole. Women now comprise 30 percent of all attorneys and 50 percent of all entering law students. As reported by the ABA’s Commission on Women in the Profession, the number of female federal judges, large law firm partners, and general counsel has more than doubled since 1987. The prominence of women lawyers from the United States Supreme Court to the Senate speak to women’s increased influence, not only on the profession of law, but on the social, economic, and political circles of society. These gains have opened doors for women who work as in-house counsel. Seventy-five companies in the Fortune 500 — 15.0 percent – have a female general counsel, which is up from 8.4 percent just four years ago (see graph in this article). 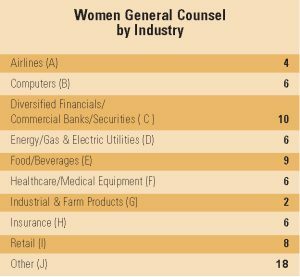 Women general counsel are found in every industry, with financial services (13.3 percent) and restaurant/ food services (12 percent) boasting the largest numbers. These influential women run legal departments ranging from two to 350 in-house attorneys, while their companies earn revenues from $3.0 billion to $56.6 billion. Yet, a closer examination reveals disturbing trends. Plagued by the dual biases of gender and race, women of color are not ascending the ranks as quickly as white women. Of the 75 women general counsel in the Fortune 500, only five — Paula Boggs of Starbucks Corporation, Michelle Coleman Mayes of Pitney Bowes Inc., Gloria Santona of McDonald’s Corporation, Kellye Walker of BJ’s Wholesale Club, Inc. and Andrea Zopp of Sears Roebuck & Co. — are minority women, which is just barely one percent. All were appointed between 2000 and 2003. Of the 42 minority general counsel in the Fortune 1000, only 11 are women. The comparison is even starker when one considers that there are 124 women and 42 minorities leading Fortune 1000 company law departments, representing a combined percentage of approximately 16 percent of this elite group; however, only 11 of these general counsel positions are held by women of color. Despite the progress of women in law, female attorneys on average earned $20,000 less than male attorneys.1 Many corporate departments and law firms still fail to provide adequate access to support networks, such as informal mentoring and social activities, which in turn lead to career development and high-profile assignments. Only 11 percent of women lawyers overall, compared with 18 percent of male lawyers, work in corporate counsel offices,2 despite the fact that inhouse departments purportedly give attorneys increased control over work/life balance issues, respite from rainmaking responsibilities, and greater advancement opportunities. Proactive efforts, such as the Houston Bar Association’s 2003 Gender Initiative Commitment Statement, which pledges signatories to increasing the number of women at management and partnership levels and improving retention rates by 2007, go a long way. Senior executives who pressure outside counsel and staffing agencies to produce diverse candidates also help. Diverse recruitment practices, such as networking with women and minority bar associations, or actively developing relationships with the Historically Black Colleges and Universities7 and circumventing potentially non-diverse recruitment pools within law firms, also assist in improving these numbers. Innovative diversity initiatives across-the-board do much in enabling the legal industry to meet the needs of an increasingly diverse corporate sector, and to debunk the myths about women’s legal aptitude. But more than initiatives, successful women general counsel themselves are the best argument for diversity. 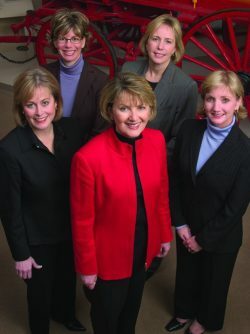 In a single city — Houston, Texas — women like Peggy Heeg, Kerry Galvin, Carol Graebner, Cathy Lamboley, and Jennifer Vogel, all chief legal officers of Fortune 500 companies, are examples for departments nationwide on how women general counsel can help lead a company to success. Their accomplishments are part of the unwritten success story of diversity in Houston — the tenth largest and fastest growing city in the United States. With 19 Fortune 500 companies, expansive international business opportunities, no racial or ethnic majority, and an ever-expanding global economy, Houston caters to those seeking an exciting corporate legal environment. The city has embraced diversity and, consequently, reaped the rewards of a healthy economy. So how did Houston become a diversity example for the entire country? Not surprisingly, through the drive and dedication of its women. “There were no female officers in 1989 when I started at Tenneco (which was acquired by El Paso in 1995),” says Peggy Heeg, who assumed responsibility for all legal functions at El Paso Corporation when she became executive vice president and general counsel in 2001. “This didn’t change until the mid-1990s,” Heeg continues. By sheer hard work and determination, Heeg ascended the ranks within El Paso. “My goal was to stay focused, to work hard, and to do the best job that I could for my client. I was confident that as long as I did this, the opportunities would come.” And indeed they did. Heeg’s determination and success at gaining the confidence of her clients garnered the support of then general counsel, Britton White, which in turn led to greater responsibilities and ultimately the coveted general counsel position. In the course of Heeg’s career, she has noticed that perceptions about women as leaders and attorneys have changed, but that there is still room for improvement. In response to a question as to whether real progress is being made or if changes are being made to be politically correct, Heeg responded, “To be honest, I’m not concerned with what a company’s or law firm’s motives are in assigning work or leadership positions to women or minorities. Regardless of the motive, the end result is that women and minorities are taking on greater leadership roles,” Heeg concludes. “Law firms are struggling with the inevitable changes of having a diversified employee base and meeting the diversification goals of their clients. I am confident that as companies demand diversification, law firms will respond and women will naturally take on more leadership positions,” Heeg says. Following that fated phone call, Galvin joined Lyondell’s legal department. “I found a terrific mentor in Jeff Pendergraft, the former general counsel,” says Galvin. “We shared a similar intellectual drive and philosophy about how to approach things, and he challenged and encouraged me, pushing me to develop various skills so that I might go further.” Galvin did, and shortly after the company became a larger global corporation, Galvin went overseas to manage Lyondell’s global legal services as the associate general counsel. Galvin’s burgeoning responsibilities provided her with exposure to different areas of law, and also showcased her ability as a leader. In 2000, due to her success in both capacities, Galvin was appointed vice president, general counsel, and secretary. The subsequent result is that departments have to be more flexible. “For example, allowing attorneys flextime, letting them work from home, or having back-up plans if, say, an attorney goes on maternity leave.” These changes, Galvin says, are positive and can be incorporated into the rest of the company for the benefit of all. The impact, therefore, is far-reaching. When asked how she balances her hectic work and life responsibilities, Carol Graebner jokingly responds, “Get up really early!” As executive vice president and general counsel of Dynegy Inc., a Houston-based energy company, Graebner is only half joking as mornings start at 5 a.m. with a run around Memorial Park. *Alphabets correspond with the listing of Fortune 500 Women General Counsel in this article. Graebner never had a driving ambition to be general counsel. She gained the qualifications for the position through sheer legal curiosity. “While at Conoco whenever I was offered a chance to work overseas, I always said yes. I took advantage of a number of opportunities that ultimately gave me incredible experience,” says Graebner. When the general counsel position at Conoco Global Power became available, she was the obvious choice and that experience and others prepared her for her current role at Dynegy. Today, Lamboley leads an organization of 240 people, 135 of them lawyers, and she has been successful in implementing her vision for an energized and inclusive organization. Lamboley has looked for ways to influence outside the walls of Shell. Shell Legal has a majority firm initiative that encourages the large law firms that receive the bulk of Shell’s business to assign women and minority attorneys to work performed for Shell. There’s accountability implicit in this relationship as well. Each firm routinely reports to Shell Legal what percentage of their associates and partners are women and minorities. On their invoices, Shell asks them to state the portion of their fees that were generated by women and minority lawyers. Shell Legal also has a strategic partners program, where candidate firms are asked to submit data on their demographics. If they want to partner strategically with Shell, the company wants to see women and minorities in meaningful roles with significant responsibility — not window-dressing. Vogel joined the Continental legal department eight years ago as the vice president of legal, running the day-to-day affairs of the department. When Jeff Smisek, the former general counsel, took the opportunity in 2001 to advance to a purely business role, Vogel became the general counsel. Her role has since expanded to senior vice president, corporate compliance officer and secretary. With a staff of 18, Vogel manages the worldwide legal affairs of Continental Airlines, Inc., an airline flying roughly four million passengers a month. “We handle everything, including litigation — civil, antitrust, employment, tort — real estate, intellectual property, securities and corporate governance, marketing and business transactions,” Vogel says. Vogel points to a number of changes in the legal environment that may ultimately work to women’s benefit, such as a decline in the social relationship between attorneys and clients. “I think women are effective in managing the business relationships with their clients,” says Vogel. “But a woman who is simultaneously raising children and running a household doesn’t have time for the social things, like an afternoon of golf. Fortunately, I think today’s clients don’t need it. “More emphasis is being placed on pure skill sets and one’s ability to get the job done, and this places women on a more equal footing,” Vogel concludes. While Peggy Heeg, Kerry Galvin, Carol Graebner, Cathy Lamboley, and Jennifer Vogel provide role models to women in-house attorneys, the city of Houston itself should be a role model to cities all across the nation. Houston has harnessed the talent and ambition of its women and people of color, and so, too, should all of America’s cities that wish to compete globally in the 21st century. Alea Jasmin Mitchell worked for MCCA® as a summer intern upon her graduation from Wesleyan. She is now the features editor for Diversity & the Bar and a freelance writer based in New York City. ABA Commission on Women in the Profession, The Unfinished Agenda: Women in the Legal Profession, (2001), pg. 5. The National Association of Law Placement, “Women and Attorneys of Color Continue to Make Small Gains at Large Law Firms” (November 2003), www.nalp.org/press/minrwom03.htm. The U.S. Equal Employment Opportunity Commission, Diversity in Law Firms: U.S. Equal Employment Opportunity Commission (2003), pg. 4. In a study of eight large New York corporate law firms that tracked cohorts of first-year associates across two 10-year periods, researchers found that 19 percent of men attained partnership, compared to only eight percent of women. Lisa Trei, “Women Lawyers Continue to Battle Gender Bias, Rhode tells Conference,” Stanford Report (March 2002). For recommendations, see Creating Pathways to Diversity® : A Study of Law Departments Best Practices (2001).